For express shipments after 12:30 p.m. Eastern time Mon-Thurs. please call 1-888-496-6383 to ensure prompt delivery. For weekend shipping please contact us for options and pricing. The Hoegh #20 Pet Casket is built for lasting durability and quality. All units are constructed of strong, high-impact styrene. The design and special sealant restrict seepage of water and the intrusion of air. Hoegh pet caskets are capable of serving as a Casket-Vault combination. 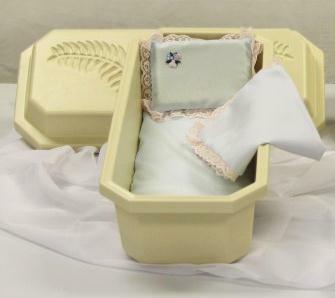 The Regular Style casket features a reversible blue/pink pad and pillow trimmed generously with lace. A coverlet is available at an additional cost.